This season I was lucky to be invited to the Christian Siriano Fall 2012 fashion show for the first time! I’ve always dreamed of seeing his show in person and it was an honor to be there. Inspired by the 1933 horror movie The Vampire Bat, the collection was dark and a bit more subdued than what we’re used to seeing from the ultra-glitzy designer. Nonetheless there were still just enough glamour accents to stay true to his brand’s identity. 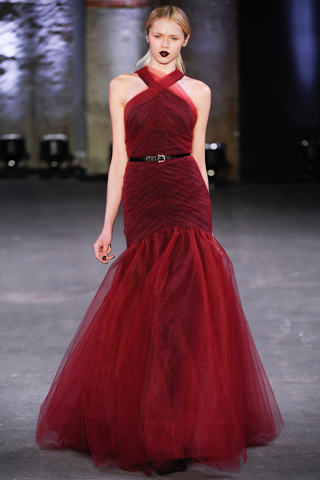 The collection's color palette was filled with mostly dark colors like red, black and grey. Two of my favorite pieces were the below jacket over long maxi skirt looks. I'm a huge fan of the front slit in the black maxi skirt and could definitively see myself pulling the Angelina Jolie one leg pose in this look!